Scientists from the Universities of Antwerp and Hasselt (Belgium) have predicted that the temporary effect of a rise in shingles cases dominates in 31 to 40-year-olds. This is younger than previously predicted and this age group is less at risk of developing the most serious shingles symptoms. 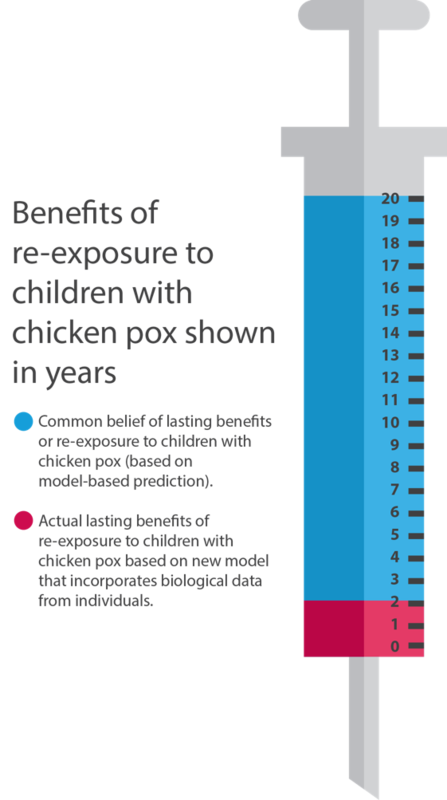 Many countries have avoided introducing universal chickenpox vaccination in children because it was previously predicted that the reduction in chickenpox related disease would be outbalanced by the temporarily increase in shingles-related disease. Vaccination programmes are established in some countries including the US, Australia, Greece, Germany, Japan and Taiwan. However, as most – but not all - chickenpox cases are mild, whereas shingles causes a painful rash and can lead to complications such as prolonged pain (postherpetic neuralgia), policy makers in other countries have hesitated to introduce childhood vaccination. Shingles occurs most often in individuals with a declined immunological status, such as HIV or cancer patients. Ageing is also assumed to increase susceptibility. In previous studies, Ogunjimi and colleagues found that the impact of ageing is exacerbated by Cytomegalovirus infection, another virus in the herpes family. The current model combines data from individuals relating to all these factors, making it more accurate than previous models and easier to verify with future clinical studies. “Our new model relates to real biological functions, increasing its value for determining health policy,” says Dr Ogunjimi.